After you have completed your velocity picking, you can export the resulting volume in the same way as any other volume. Picks can also be exported and imported. If you are working on a project that requires picking to be divided to multiple sub-projects, you may find that combining the picks (rather than the volume) will create a smoother velocity model. 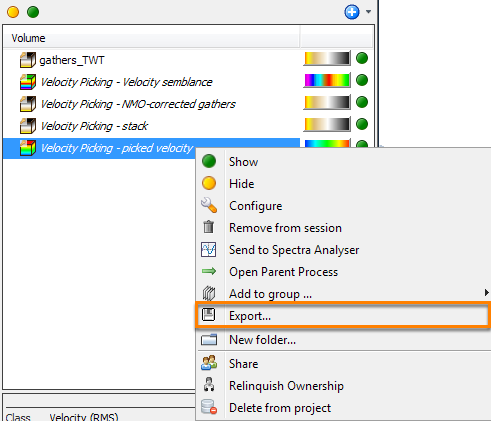 From the Volume tab, select the resulting velocity you want to export. Right click and select Export. The Export Volume window will be displayed. 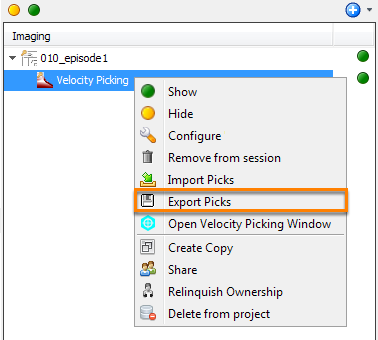 Follow the steps in Exporting a Volume in DUG I/O to export the volume. From the Imaging tab, select the Velocity Picking process that you have created. Right click and select Export Picks. The Export Picks window will be displayed. At File, click on the Folder icon to choose a destination for your export and type a new name for the picks. The file will be saved in a .dugvelpick format. Select a probe or a polygon at Constrain to area to constrain the exported picks to a particular section. If you have previously imported picks, select the Include imported picks check box. 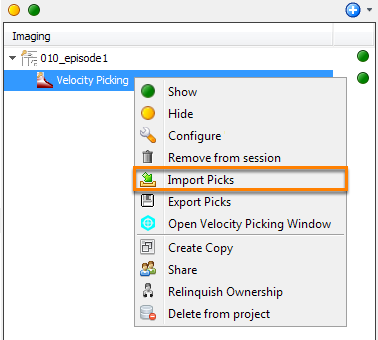 At the Imaging tab, select the velocity picking process that you wish to import picks. Right click and select Import Picks. The Import Picks window will be displayed. At File, click on the Folder icon to browse to the picks you wish to import. You can only import picks in .dugvelpick format. Select a probe or a polygon at Constrain to area to constrain the imported picks to a particular section. If you have any existing picks, select the Replace picks at already picked locations check box to replace your current picks. Otherwise, leave the box unchecked.